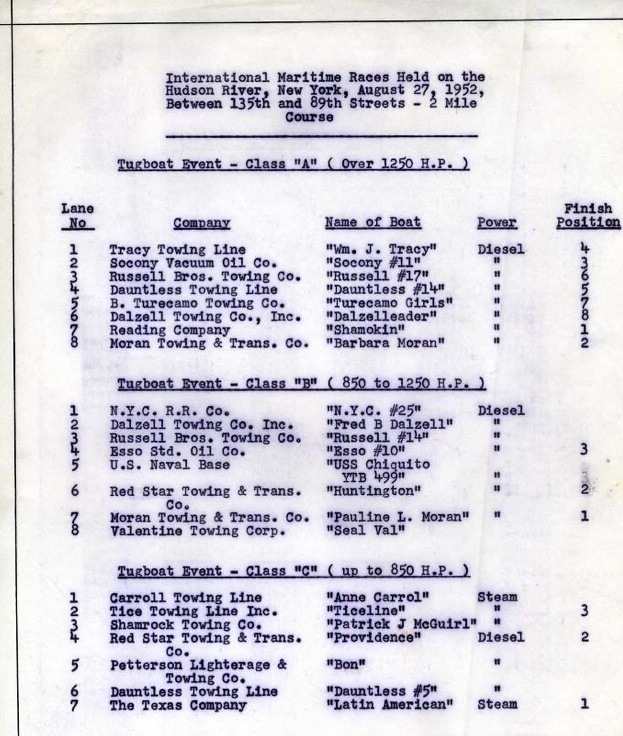 The race took place exactly 60 years ago today, and megathanks and superkudos to Harold Tartell for finding fotos of more than half of the boats involved in the race. Top Class A (over 1250 hp) finisher was Reading Lines Shamokin. No foto found yet of third place Socony 11, but fourth place was William J. Tracy of Tracy Towing Line. Again, no foto of Dauntless #14, but here’s sixth place finisher Russell #17. And rounding out Class A, here’s Dalzelleader. In the Class B division (850 to 1250 hp), top boat was Pauline L. Moran. Number two finisher was Red Star Towing & Transportation‘s Huntington. 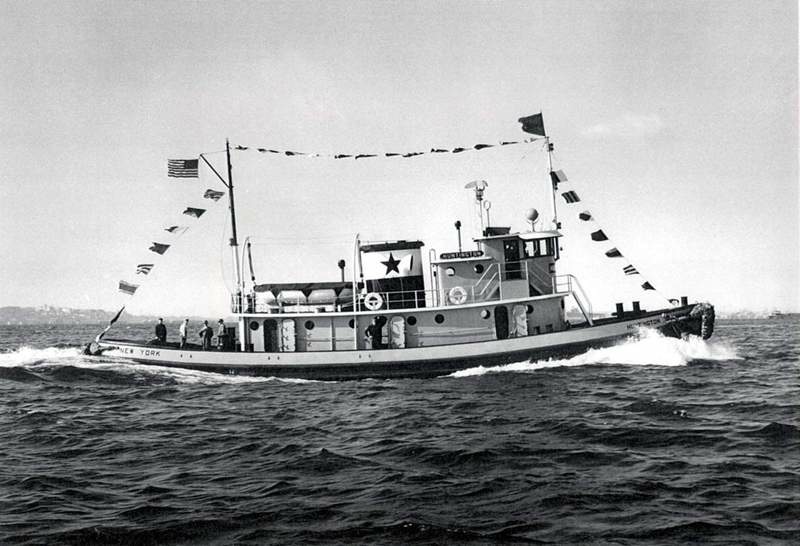 In Class C (less than 850 hp), the top finisher was steam vessel Latin American, operating for the Texas Company. 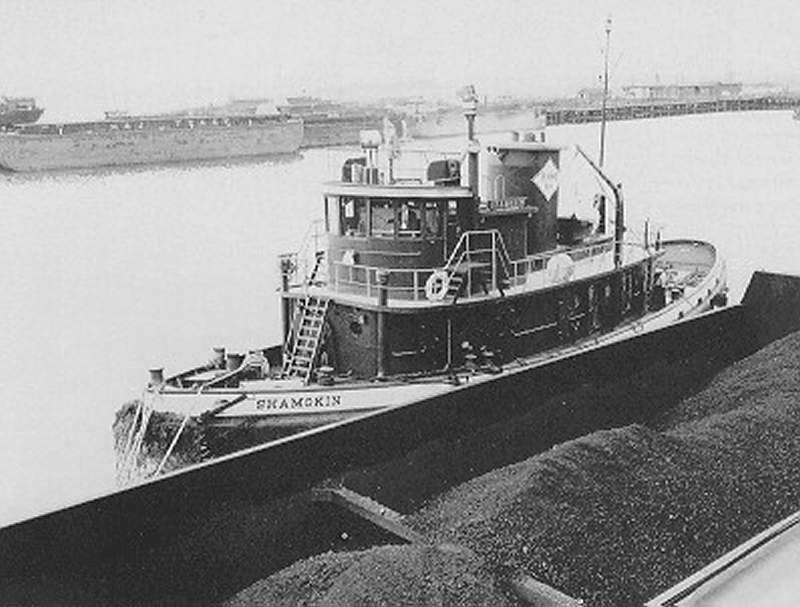 Number two Class C boat was Providence, of the Red Star Towing & Transportation. 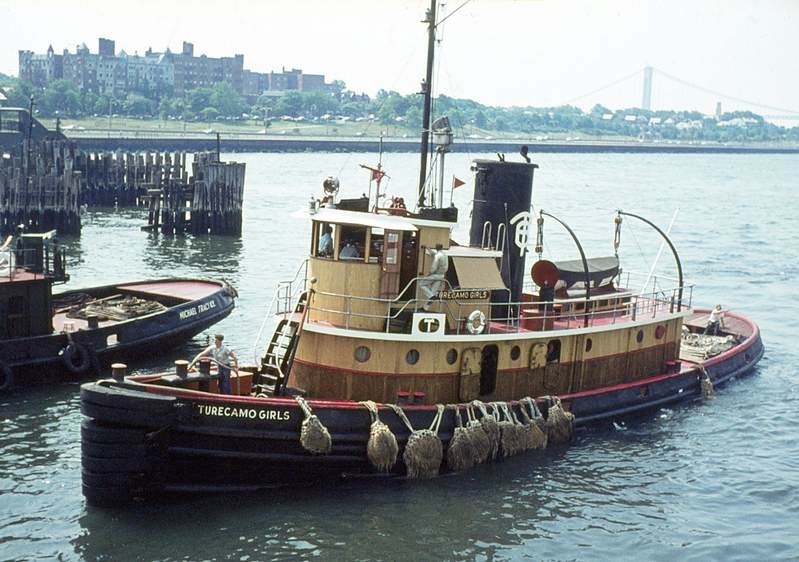 Third place Class C finisher was Ticeline, of Tice Towing Line, Inc.
Anne Carrol, a 1910 steamer of Carroll Towing Line also ran. Queen Elizabeth was crowned, nuclear sub Nautilus keel was laid, a B-52 first flew, SS United States first crossed the Atlantic, Ike became President, the word “smog” was coined in reference to London weather, Albert Schweitzer won the Nobel Peace Prize, lots of UFOs buzzed Washington DC airport, and Werner von Braun published Man Will Conquer Space Soon. This last entry reminds me of the Mr Armstrong that died a few days ago. I’ll never forget the July night in 1969 that I, age 17 then, stayed up all night even though it was haying season; I’d worked in the hay all day July 20, and stayed up much of the night before working again all day on the 21st. My father thought I was crazy but my mother came downstairs to watch with me a few times during the night. “What will it change?” she asked in different ways, and I surely had no answer, as excited as I was. 43 years and a month later . . . well, maybe it didn’t change anything related to our travel destinations, but the some of the technology we live with on earth stems from those efforts. A final thought: I recently read a statement by Robert Ballard saying that the NASA budget (I’m not sure which year he was talking about.) for ONE year equals the NOAA budget for 18 years. As much admiration as I have for Neil Armstrong, maybe the next heroic explorations should involve walking along the bottoms of the oceans. Harold . . . I hope your family illness will subside so that you can attend the tugboat race this coming weekend. Thanks again for these archival fotos. 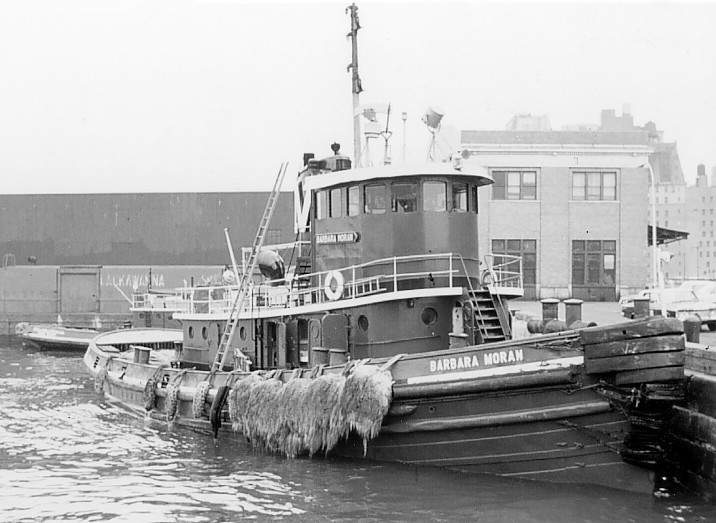 tugboathunter– in sturgeon bay, do you know the company, whether she still goes by huntington, and if there’s a foto somewhere to be found? thanks . . . 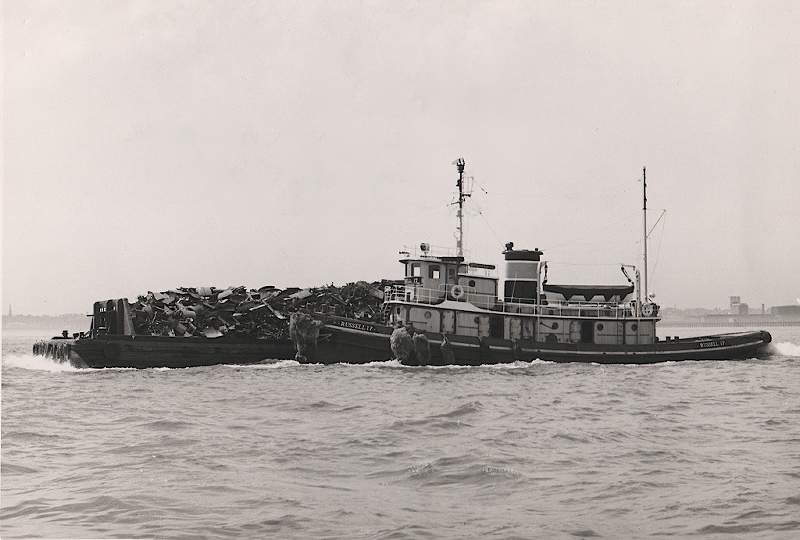 In response to Tugboathunter’s comment in yesterday’s blog, there are many new tugs in the Moran fleet named for both members of the Barker & Tregurtha families. 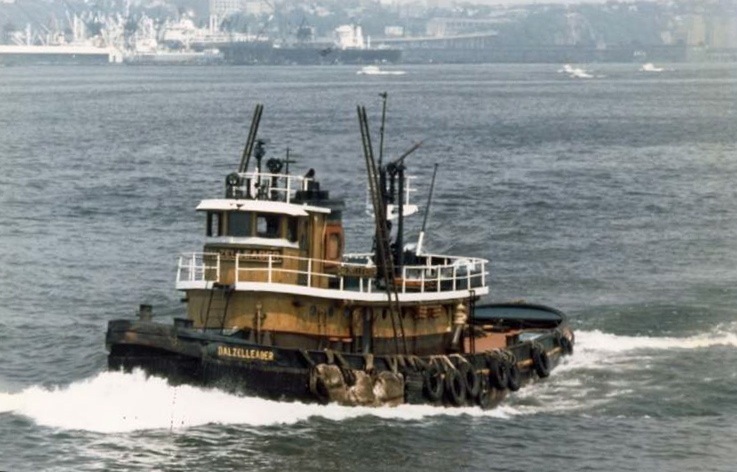 Moran was bought out in 1994 by the Tregurtha’s http://www.morantug.com/site/#/corporatehistory, & tugs that were delivered new to the company, with the exception of the Turecamo Maritime fleet purchased in 1998 since then, have been named for these family members. 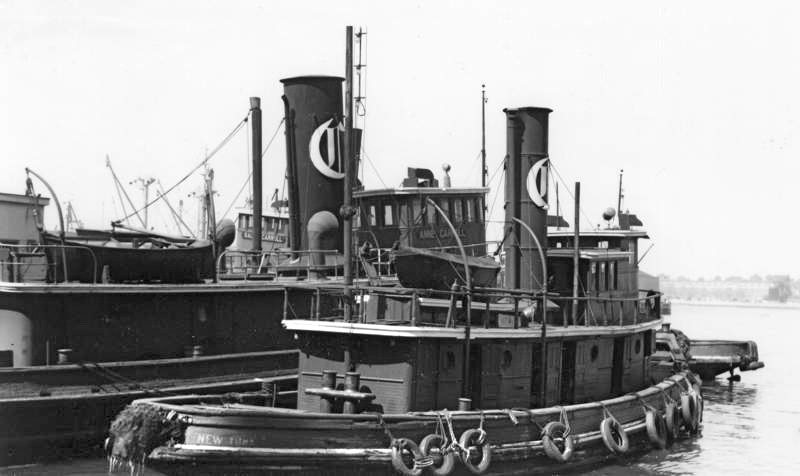 There are still tugs remaining named for members of the Moran Family, & the Coppedge family, which stems from the purchase of Florida Towing Corp., which was owned by W.T. Coppedge. 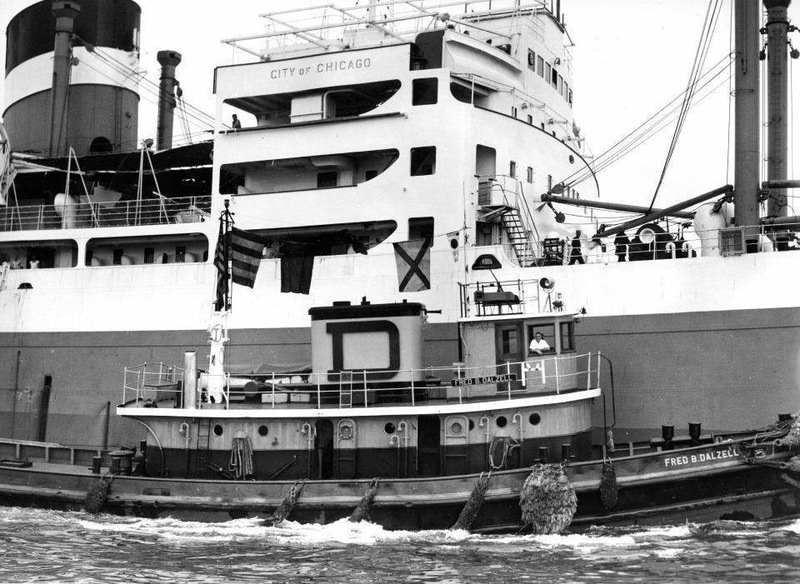 It’s very interesting to note that all of the vessels that participated in the 1952 Tug Race are all gone with the exception of two. Both of these are in pictures that I shared with Will, and are posted on this blog. 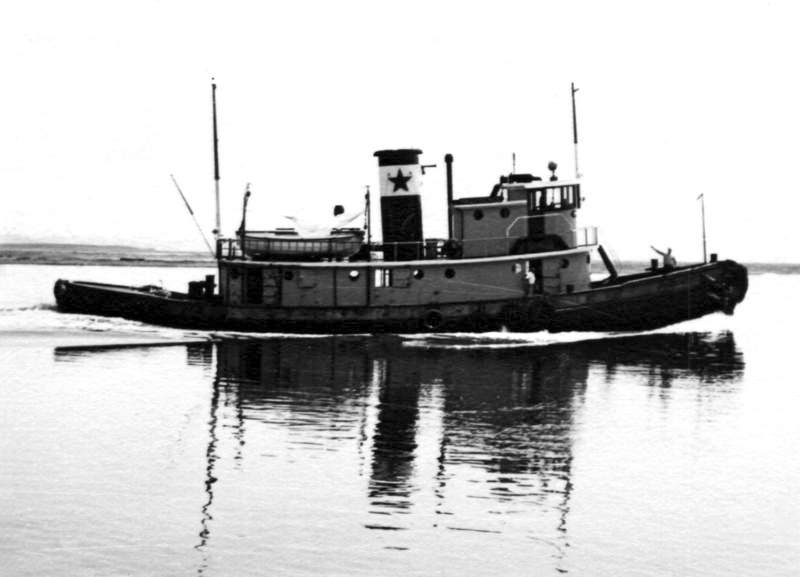 FRED B. DALZELL was sold to Sheepscot Pilots, Inc (now Winslow Marine, Inc.) & became ELIOT WINSLOW. Check this pdf http://www.towingline.com/wp-content/uploads/2010/01/V2-ME-A1.pdf, & look under Tug PORT CLINTON for her complete history. She was owned for a while by the Portsmouth Navigation Co., Portsmouth, N.H. which was bought out by Moran. 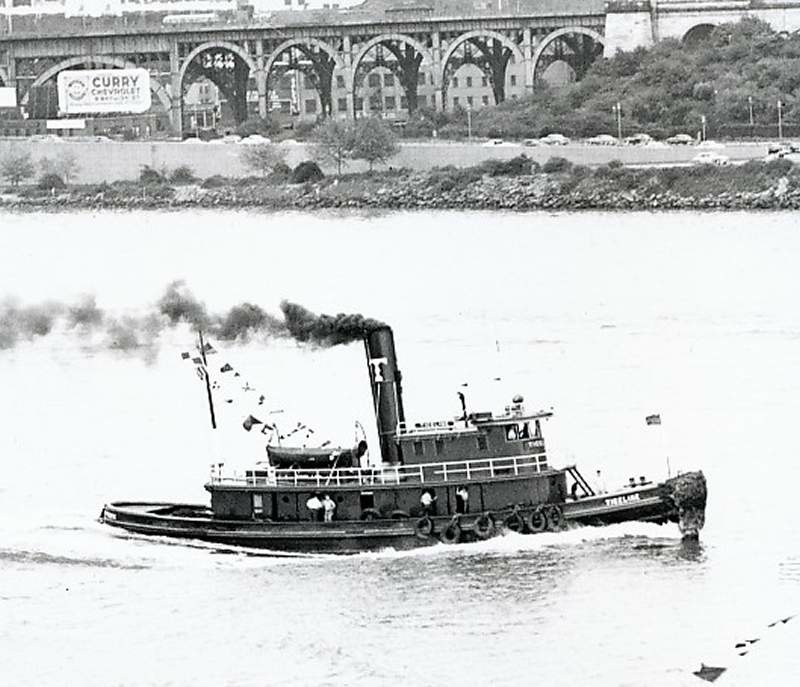 She was known there as NEW CASTLE http://www.tugboatinformation.com/tug.cfm?id=1739. 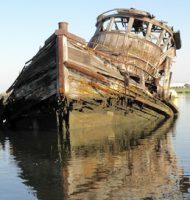 She was sold in 1982 to Winslow, & renamed ELIOT WINSLOW http://www.winslowmarine.us/photos.htm. The HUNTINGTON was owned by the Kosnac Floating Derrick Corp., NY. 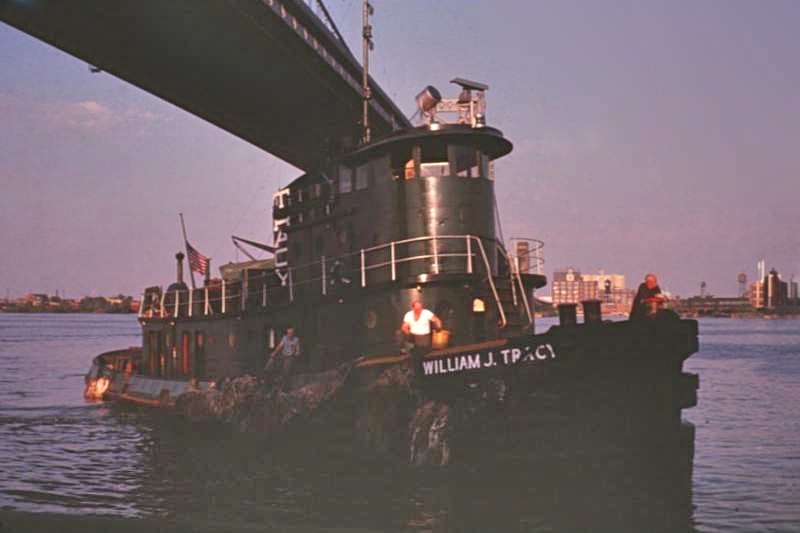 http://www.tugboatinformation.com/tug.cfm?id=371, after being sold by her original owners Red Star Towing & Trans. 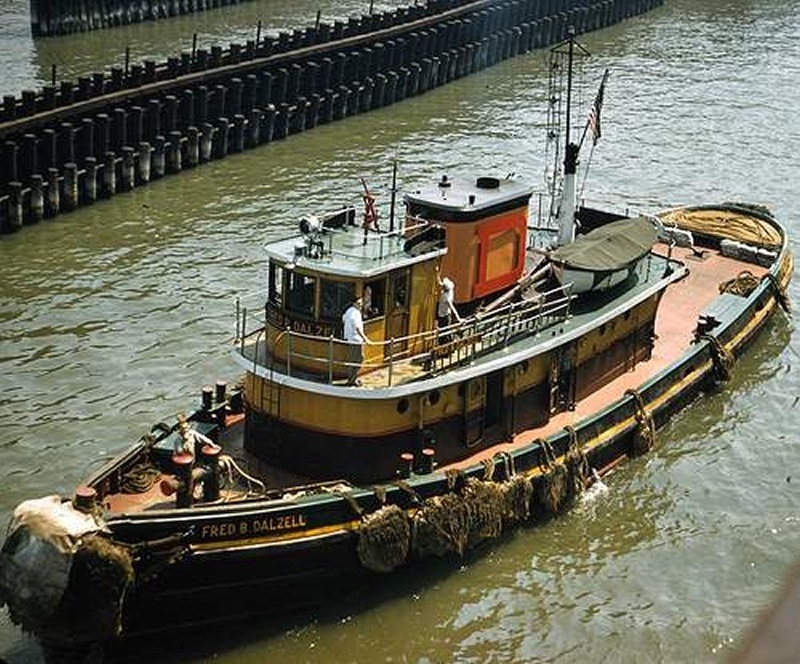 Co. She was sold in 2007 to Calumet River Fleeting Co., Brussels, Wisconsin & renamed NATHAN S.
Both ELIOT WINSLOW & NATHAN S. are still under documentation. Whether they are still operational at this time is unknown. Previous Vessel Names:	No Vessel Name Changes	Previous Vessel Owners:	SHEEPSCOT PILOTS,INC. As a small boy, probably six or seven, my mother caged a day on the Fred B. Dalzell for the two of us as the Fred went about her work in the harbor. She had a Fairbanks Morse engine at the time, which as I look over the data, must have been direct reversing. Can anyone confirm? I knew the Opposed Piston Fairbanks engines pretty well from the Submarine installations I used to inspect, but my recollection from long ago was that the Fred’s engine wasn’t an OP. The day was a thrill, and the crew was great, taking pride in showing off the tug. Thanks for the pictures and the link – brought back nice memories. Just love looking at the old photos but i’m surprised Esso had no entries in the race. I was a 7 year old kid back then and remember the races being discussed for weeks at our house. 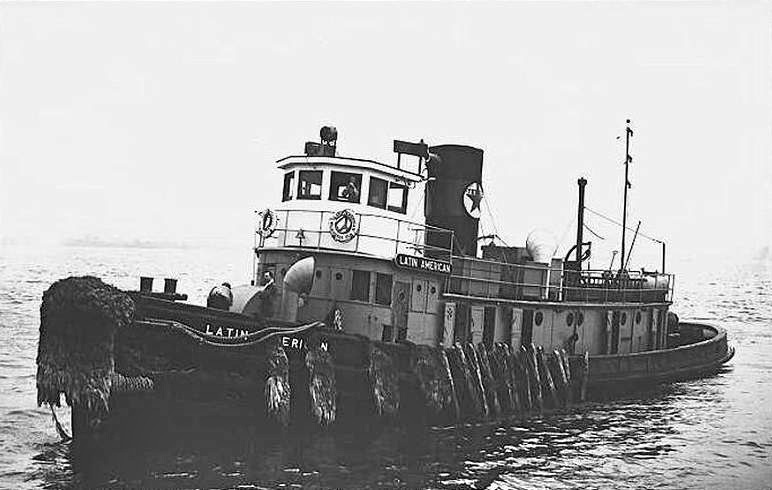 The Steam powered Tug Latin America, Texas Company won the 850Hp C Class. 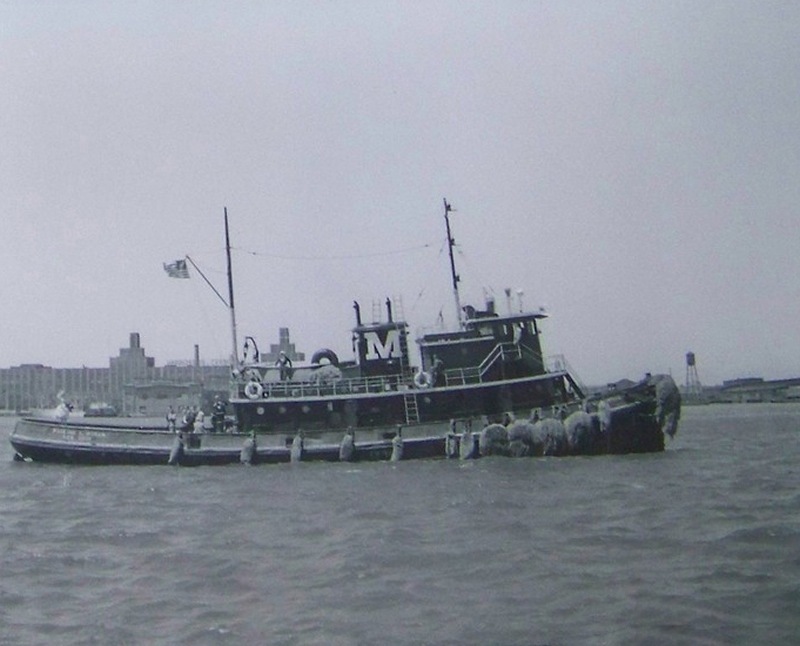 The SS Badger contiumes to Steam across Lake Michigan! My grandmother and great uncles spent their early years on the river, they hauled coal and lumber up and down the river. He retired from the river and became an engineer on the Hudson River West Coast Line. He lived out his life on the river dying on his boat in Edgewater I think. In his obituary they refer to him as “Pop Adams” . Any records or info about him would be greatly appreciated. Hi Michael, I don’t have any information but I do know that the names of the other fellows you mentioned come up in Joseph Mitchell’s short essay “The Rivermen,” which is in his great collection of stories about New York’s waterways called “The Bottom of the Harbor.” Those names are tied to Edgewater, New Jersey. You might have some luck searching records over there. Good Luck!